Early this year, my 1956 310 was in the shop of my preferred maintenance facility, Iredell Aircare, Statesville, NC, for an annual inspection when the shop caught on fire. The plane was one of five lost due to extreme heat and smoke damage. Miraculously, the fire never made it to the shop floor so the planes never actually caught on fire. The danger and added devastation that could have resulted if the fire had reached the floor and the airplanes is something all of us chose not to ponder too long. The fire crews did a terrific job of extinguishing the blaze without any injury. The impact this event had on the long standing maintenance business is a story for another time. But I am happy to report that due to, in part, support from Iredell Aircare’s customers, friends, airport management, and efforts facilitated through organizations such as our very own Cessna Pilots Association (CPA), they will be remaining in business. And this was a huge relief to their many customers – myself included. The owner/operators, Jones and Rachel Barnes, are of retirement age and this could have been their reason to call it quits. But that would have been a huge loss to the aviation community and a horrible way to end such a distinguished run. This is not only because of their unmatched wealth of knowledge in maintaining GA aircraft – especially legacy airplanes – but for their equal level of kindness and caring for their customers. 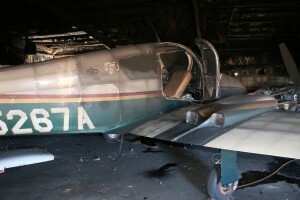 On Saturday, Jones and Rachel’s hangar burned and N5267A was one of the five airplanes inside. I am so sorry to interrupt your vacation with this news. Jones and Rachel did not want to ruin your vacation, but I thought you might prefer to be in the know. They have contacted their insurer and that process is underway. Is there anyone we can notify on your behalf? So sorry for the bad news. The fact that Jones and Rachel didn’t want me to know while away on vacation speaks volumes to the 19 year relationship I’ve enjoyed with them. They are good friends as well as service providers. Not only that, they knew how special that 310 was to me. I am a die-hard classic Cessna 310 fan. This one was my second classic and the plane I expected to run out most of my remaining ownership clock with – the “keeper”. N5267A was at that stage of aircraft ownership we all strive for – incredibly reliable at dispatch – Start, Fly, Land, Repeat. You just read about one such extended trip in the past two issues of this magazine. And if being on time to an appointment was critical, I always allowed an extra 15 minutes on the arrival because I’d usually have an instant reception on out of town ramps of pilots wanting to know more about this fully restored and updated plane. I will notify your insurance carrier and will have a claims adjuster assigned to this incident. There is really nothing you can do from where you are, so my advice to you is to get a glass of wine, enjoy the sunset, and make the most of your vacation! My wife and I took his advice. And upon returning home later that following Saturday, my voicemail had a message on it from the insurance claims adjuster, Jim Brewer, [Inflite Aviation International Adjusters, Denver, NC]. On Sunday we had a full plate of church and family activities to attend. But I did call Brewer, as well as Jones just to see how he was doing. He told me Brewer had already been out to the airport twice working on my claim. It wasn’t until Monday that I finally made it out to the airport to see the aftermath. What a terrible mess. Jones walked me through the dark hangar that looked and smelled like metallic death. The thick, corrosive smoke and over 1,600 degree heat sealed the fate of these five planes – my 310, a Piper Comanche, a Cessna 177RG, a Cessna 414, and a Grumman Tiger. Seeing these planes – especially my 310 – gave me more of a numb feeling than anything else. The heat had been so intense you could see how the tempered metal skin caved between the ribs and stringers and the windows melted or bubbled. The corrosive nature of the smoke was something I had never seen before. My engines looked like they had thick crystals growing on the cylinders. Tools looked like they had been on a salt water boat dock for a year. It was clear these planes were a total loss. Brewer and I met a few days later to get me into the claims loop. He had some forms for me to fill out and we set up a follow-up time for when we’d meet to finish my part of the process – providing the signed forms, a signed bill of sale, and all the aircraft records. Brewer has been at this for decades. He told me that my claim was about as cut and dried as it gets. He could tell from what he saw, as well as from the records, that the 310 was well cared for. He loves airplanes and it showed. I can tell that this was more than just “an airplane”. You poured your heart and soul into making it one of the nicest “Classic 310s” around. This was your passion; your pride and joy. It was a thing of beauty. I’m sorry for your loss. Guy, so sorry to hear this. I can’t imagine how terrible you must be feeling after having this happen to your pride and joy. It was such gorgeous airplane. I hope that in the future you are able to find another plane that in all respects is as good or better than the beautiful plane you had. If anyone can find one it’s you. For those of us who love these airplanes, they are like living beings…and it has to be horrifying to get that kind of news. Here’s hoping you’re able to create some new memories with a new “baby”. I received some posts and emails where I was gently asked if there were any salvage possibilities from my plane or what I planned to do next, but only when I felt ready to talk about it. I was being treated as if I had lost a relative or a beloved pet. To some of us, I guess, we hold our planes more dear than even some relatives! I assured them that I was fine and no question was off limits. Another big question posed to me was how I would fare on insurance. I quickly knew I would be just fine. Here’s where the value of a good broker – who actually works for the client, gives solid advice, and jumps right in when there is a problem – can’t be overstated. This is because your broker is the hub of the team. Joe placed me with Hallmark Insurance Company through Hallmark’s agent, Aerospace Insurance Managers, Inc. In my case, I had a check on the 27th day following the fire. There were a number of “make sense” required steps involved and Brewer kept me informed every step of the way. I couldn’t have been more pleased at how I was treated throughout the entire process – and with its resolve. My policy was written – as are most aircraft policies these days – with a stated value. This means that what the owner has stated or requested to be the value he wants to insure the plane for – and is accepted by the underwriter – will be what the underwriter pays the owner [less deductible, if any] if it’s a total loss. My 310 was insured at about the top of the scale for a plane of this vintage and roughly 50% more than most classic 310’s in similar condition. And in all truth, that was about 50% more than I could have sold it for. And yet, I was able to insure it for that amount. How? By taking the right steps through a broker who knows how to advocate for a client, and with an underwriter who knows how to balance the market with client needs. Here’s what I did correctly:  When I bought the plane I determined through my own appraisal, as well as general research, what it would take to replace it versus what I paid. The replacement value was higher than my purchase price so that’s what I asked my broker to use for my initial quote. In that request, I provided the broker with a detailed description of the plane, times, equipment list, and general condition. Joe had no problem placing me with a good company at my requested “stated” value. That was five years ago. Over the course of ownership, there were those times when I put some considerable funds into the plane. Now, I’m not talking typical maintenance events, like extensive annuals or big repairs. I’m talking about those actions that actually add market value to the plane. These can be items such as new avionics, overhauled engines, new paint and/or interior, etc. Prior to each one of these events, I reached out to Joe, told him what I was planning to do, and what I expected to need in added stated value. He then went to the underwriter to verify this would be acceptable and what it would cost. As soon as the work was done, we’d initiate the policy change and I’d pay the pro-rata rate for the rest of my policy term. This emphasizes a couple of points that many owners I talked to as a result of the fire were not aware of. First, aircraft insurance is usually stated value – not the cash value as is with most auto policies. I had a few owners who were taken by surprise at this. Possibly because cash value policies for aircraft are still available. But they are far from the norm. Second, you can get a stated value that’s higher than average “market” value so long as you can show why it’s higher. And third, you can – and should – update your stated aircraft value when it happens rather than waiting until your policy renewal. Some may question why I would insure my 310 for considerably over current market value. Here’s why; we purchase insurance to make us as financially whole as we can on the airplane loss, and protect us from liability suits. When I updated my 310, I was well aware that I was putting more money into the plane than I’d never see on resale. But just because I was willing to invest what I needed and take a paper loss on resale doesn’t mean I was willing to risk that investment should the plane be taken away from me. I lost 67A on an unplanned time schedule – not mine. That’s why I was adamant about keeping up with my ongoing improvements that added value to the airplane. Brewer told me he had a long talk with the actual underwriter who originally wrote my policy, as well as signed off on the additions. He said I did it the right way, and the increases were well documented and justifiable and he had no problem upping the insured amount. Some will say that my 310 was an “over insured” plane. And in that situation an underwriter can force you to repair a major damage event instead of declaring what you hoped would be a total loss. Yes, this could happen. But in my case, I wasn’t “over insured”. I insured the plane for my real cash investment. And I would rather trust that I will get a proper quality repair if it isn’t totaled, than suffer a huge financial loss if it is totaled. Conversely, if you under insure – declare a stated value of $50,000 on an $80,000 investment for example – to save a few hundred bucks on annual premium and the plane sustains enough damage, the odds are incredibly high that the adjuster will total the plane, sell off the salvage and leave you $30,000 down. I know if I wasn’t happy with the service of a lazy broker – pretending to know what an underwriter would say instead of checking – I’d certainly switch brokers. Under certain circumstances, an owner may be maxed out on insurable value – especially if he incorrectly over insured to begin with. The best time to check into all of this is before you make the big upgrade purchase – not after. Besides properly insuring your airplane, the other critical factor is record keeping. I have pounded on this subject in these pages already. But it’s worth another pounding. In the case of this fire, there were scores of customer logbooks under the care of this shop. Fortunately, Jones had the smarts to install a safe that resembled the massive bank safes you see on TV shows like Gunsmoke. And still, the fire was so intense that it destroyed the lock tumblers and the safe had to be cut to gain access. All the logbooks were intact, with some sustaining a little water and/or smoke damage. It boggles my mind when I receive airplanes to sell, or examine them as a buyer’s agent to discover that the original logs that came with the plane are the only logs. There are no copies, no digital scans – nothing! I know of many owners who just faithfully – and blindly – turn over their logs to their favorite shop and never look at them again during the course of their ownership. And this even includes not examining them after maintenance actions. Not only is this not very bright, it’s also against the FAR’s in that you as the pilot in command are responsible for determining if the plane is fit to fly. How are you going to know this unless you check the logs for post maintenance endorsements, annual inspections, IFR certifications, etc.? What if you have an accident and didn’t know your logs weren’t signed off properly? And then your adjuster asks you to prove the inspection as required by your policy. Now, I can tell you that the old days of aviation insurance companies looking for every way they can to deny or delay a claim are pretty much gone. But the fact is they still have to prove compliance with the terms of your policy. In the case of the fire, it was a little easier. But if the accident – like most of them – is a result of an in-flight operation gone wrong, then those logs are crucial to the claims process. There’s another reason why the logs are so important. Because my logs were so complete and detailed – showing the level of care this plane received – my adjuster was able to sell the salvage for double what the plane would have brought had the logs been missing or marginal. And if you think, “What do I care, I got my money?” Remember that when the underwriters total up all the cash in versus cash out for the year, that bottom line goes directly to next year’s rate schedule. It affects us all. So I adamantly suggest that you take a hard look at your logbook situation. Where are your logs right now? Are they detailed and complete? How much of an impact would it make on you if those logs were lost or destroyed right now? Do you have any back-ups? Can the back-ups be lost or destroyed? My logs were complete and detailed. The originals were stored in a fire safe at my home. The current set was at the shop since my plane was in for an annual. I had a full digital set stored on my computer and the back-up drive I update each month. And finally, the full set of digital logs were also stored in off-site cloud storage just in case my home-based originals and back-ups were destroyed. If you must carry your aircraft logs in the plane – such as traveling to a favorite shop for an annual – that’s another big reason for having back-ups. It makes it very easy to prove your plane was in compliance with the reg’s. You must consider the logs as a critical component of the plane. You wouldn’t come to a shop, accept the plane, pay the bill and fly off with a flap missing. The logs are just as important. Only when you are satisfied with the work, and the logs addressing the work are complete, should you pay the bill and fly home. Insurance is the one product we buy but hope [along with the underwriter] that we never use. My plan was that I’d have 67A for many more years. I was willing to pay for that in investment versus final return when I was done. But I was not willing to take that loss if the plane was stripped away from me. I know those premium checks can feel hard to write at times. But unless you’re prepared to cover the loss yourself, consider the consequences before cutting your coverage. So make sure you have the plane properly valued, insured, and documented – with back-ups. Do your homework first. Find a good broker and then keep him/her in the loop throughout the entire coverage year – not just at renewal time. As a result of how I insured my plane, I came out financially whole and was able to move to the next airplane – a 1973 Cessna 310Q. And in the end, that’s all we can hope for from our underwriter in our effort to keep our flying dreams from going up in smoke. Guy R. Maher is a dual-rated ATP/Commercial pilot and CFI for airplanes, helicopters, and instruments. He is an FAA FAASTeam member with nearly 17,000 hours – all civilian general aviation. He operates the aviation services company he founded – Lanier Media – specializing in aircraft sales and acquisitions, type-specific training, multi-media productions, and litigation support. Maher is also an NAAA certified aircraft appraiser and owns a 1973 Cessna 310Q. He can be contacted at laniermedia@gmail.com.